I’m a sucker for minimalist designed products. (I’m also a sucker for heavily maximilist designed products… so, I think, really, I’m just not a fan of the meandering middle ground. Either pack it on or simplify!) 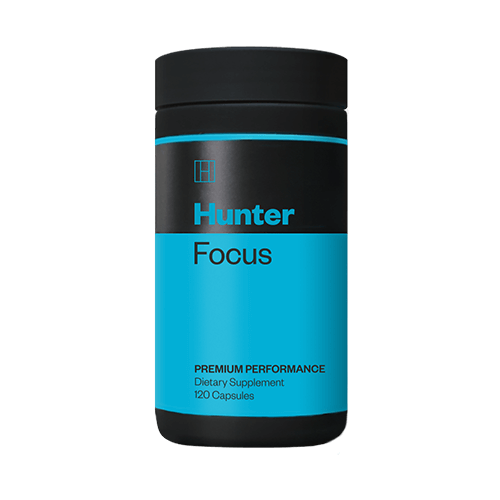 Hunter Focus is a minimalist designed supplement — from its dichromatic label to its straight-to-the-point nine-ingredient formula. Which all sounds good… but does this sleek supplement actually deliver on these promises? Let’s read the Hunter Focus review to find out. Conclusion: Does Hunter Focus Work? By Roar Ambition, Hunter Focus is a “Premium Performance” nootropic supplement that plans to boost focus with nine all-natural ingredients. No stimulants here, baby. From Lion’s Mane’s NGF boosts to L-theanine’s alpha brainwave promotion, Hunter Focus covers a diverse spectrum of short- and long-term brain benefits. No stimulants? How can a nootropic stack boost focus without stimulants? If anything, by taking the calmer, anxiolytic path Hunter Focus may actually boost focus better than your usual stimulant stack. Lion’s Mane Mushroom – I’m seeing this nootropic shroom more and more in brain health supplements. This makes me happy. Lion’s Mane is great for neuroregeneration and neuroprotection, thanks to the fungus’ potential boost on nerve growth factor (NGF). More on Lion’s Mane. Ashwagandha Extract (Std. to 1.5% Withanolides) – Rhodiola is the pre-activity, anti-stress adaptogen while ashwagandha is the post-activity “let’s chill out” anti-stress adaptogen. It’s an anxiolytic (anti-anxiety) mood booster that borders on the side of sedation, potentially impairing cognition. (Although, not significantly — I enjoy ashwagandha’s anxiety relief for better work performance.) More on Ashwagandha. Citicoline – One part choline, another part cytidine (the precursor to uridine) — citicoline is a powerhouse cholinergic, improving both acetylcholine status and synaptic plasticity. Citicoline’s great for brain energy and repair. More on Citicoline. Passion Flower 10:1 Extract – An interesting choice here. 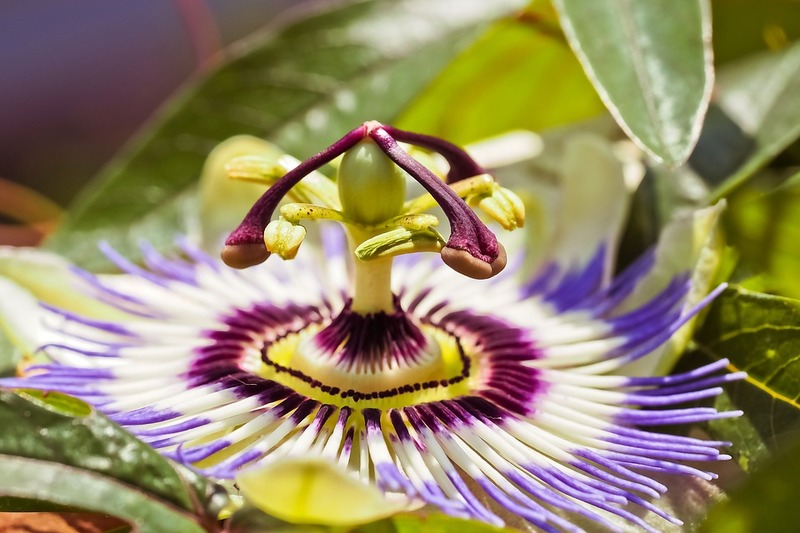 Passionflower is typically found in sleep aid supplements for its reliable relaxant effects. It may work as a mood booster, improving mental performance insomuch that an overactive mind impairs performance. You won’t find a more passionate flower than passionflower, baby. Bacopa Monnieri (Std. to 20% Bacosides) – This multi-purpose herb does quite a bit for cognition. While it may take a couple weeks of daily supplementation to reach peak effect, once it hits it hits well, improving various measures of mental performance, including memory, learning, and stress relief. More on Bacopa Monnieri. N-Acetyl-L-Tyrosine – One of my favorite anti-stress nootropics, NALT replenishes the brain’s catecholamine neurotransmitter levels for sustained focus and mood. While it’s not substitute for sleep, NALT may help alleviate cognition impaired by sleep deprivation. More on L-Tyrosine. L-Theanine – Hugely popular nootropic amino for its well-documented complementary effects on caffeine. L-theanine essentially increases focus and calm, reducing the jittery side effects of caffeine (and other stimulants) while sustaining the energy boosting benefits. More on L-Theanine. Phosphatidylserine (from Sunflower Lecithin) – Strangely, Roar Ambition shows soybeans on its website (as you can see in the image below the Supplement Facts), yet they don’t use soy-derived PS. Hunter Focus’ supplies the cleaner sunflower-derived stuff. Either way, phosphatidylserine is great for memory and cognitive clarity. More on Phosphatidylserine. Maritime Pine Bark Extract (Std. to 95% Proanthocyanidins) – Another interesting ingredient. Only other supplements I see sporting this awesome antioxidant-rich extract are Mind Lab Pro and Performance Lab Mind. Maritime pine bark extract’s proanthocyanidins offer significant neuroprotective and neuroregenerative advantages. When the adrenaline hits, it’s important to stay calm and measured. Hunters understand this, as overexcitation — or the “nerves” — may disrupt a clean, focused shot. Hunter Focus understands this as well, judging by the formula’s complete lack of caffeine and synthetic stimulants. In fact, Hunter Focus accomplishes better focus and mental performance through mental calmers rather than mental stimulants. And guess what y’all: I dig it. One of the first stacks many nootropic noobs try is the caffeine + L-theanine duo. And it’s a good place to start as you get the familiar, feel-good rush of caffeine paired with the smooth L-theanine calm. However, as nootropic enthusiasts advance their noot game, many toss caffeine altogether, finding their brain boosts through the likes of citicoline, L-tyrosine, phosphatidylserine, etc. — ingredients that don’t cheaply flush the brain with stimulation but increase natural ATP and neurochemical energy instead. And this is what Hunter Focus does: it smartly stacks with natural brain boosters with anxiolytic compounds (ashwagandha, passionflower, L-theanine) to keep the brain fully optimized and balanced. Additionally, Hunter Focus supplies Lion’s Mane and Maritime Pine Bark Extract for daily brain health improvements, giving this stack a unique short- and long-term brain booster status. All-in-all, this is an impressive, all-natural brain health stack that takes the smart nootropic path to cognitive enhancement. Hunter Focus approaches mental performance through all natural, non-stimulant pathways, supplying a truly nootropic cognitive enhancement formula. All of the ingredients are of exceptional quality and quantity. No cut corners here. Roar Ambition keeps the proprietary blend shenanigans out of this product, showcasing all of its ingredient dosages. With exception to the Ultimate Cognition System pricing (see below), Hunter Focus’ price per serving is a bit a one the high end. Passionflower is an interesting choice — might err too close to sedation, unless you pair this supplement with, say, your morning cup of coffee. When you buy through the Roar Ambition online store, Roar Ambition has three pricing options, as listed above. For the third option (Ultimate Cognition System), you may buy three bottles (+ one free bottle) for a reduced price per serving. If you plan on supplementing Hunter Focus for the long run, the Ultimate Cognition System seems to be the best way to go. Also, Roar Ambition doesn’t mess around with the auto-shipping stuff (at time of writing), so no Subscribe & Save offers here. Despite the company’s name (Roar Ambition), Hunter Focus is a surprisingly contained nootropic supplement, supplying effective, brain healthy boosts rather than your usual extreme-O caffeine rush. Its mix of acute mental performance enhancers and long-term neuroprotectors make it a great stack for anyone concerned about their daily mental health. At time of writing, you can buy Hunter Focus through the Roar Ambition online store. As far as I know, there are no listings for this supplement elsewhere — e.g., Amazon, Bodybuilding, GNC. Yes, Hunter Focus works. I went into this supplement knowing next to nothing about it, and I’ve come out on the other side pleasantly surprised. Not only is Hunter Focus well-formulated, thanks to its smart ingredient choices and non-proprietary label, but it’s well-polished as well, showcasing exceptional ingredient quality and quantity. And I dig the non-stimulant design of this nootropic stack. It’s a truly brain healthy formula that may significantly improve cognitive performance through natural brain pathways. Too often we see the caffeine-driven approach to better “focus” and brainpower (which, on a molecular level, reads more like cognitive impairment). All in all, Hunter Focus is an impressive supplement that gives me little to complain about; however, if you’re looking for more awesome noot stack options, I recommend checking out my Best Nootropic Supplements of 2018 list.